We got out for a walk with the kids last weekend at San Elijo Lagoon. San Elijo Lagoon is one of my favorite places in North County. I have run there several days a week for about ten years, from the east end of the lagoon in Rancho Santa Fe along the south shore, under the freeway and to the ocean at Seaside Beach, and back again, taking me through eucalyptus groves, sage brush, a promontory that is covered with tall mustard in spring, alongside the water and past a few stands of trees that often hold raptors. The lagoon empties into the ocean in Cardiff State Beach, a stretch of beach I love for its hollow, picturesque waves. On my hundreds of San Elijo lagoon runs I have encountered a few bobcats, including a mother with four kittens, countless rabbits and rattlers, a fox, and lots of birds (that I can’t identify since I am not a birder). Saturday was a good day as it had one of the highest tides of the year which forced many birds close to the edge of the lagoon where they can be easily seen. We saw dozens of small birds, all of which we consider ducks, and several largish raptors, all of which look like hawks to us but which might have been Northern harriers. Whatever, lots of birds. 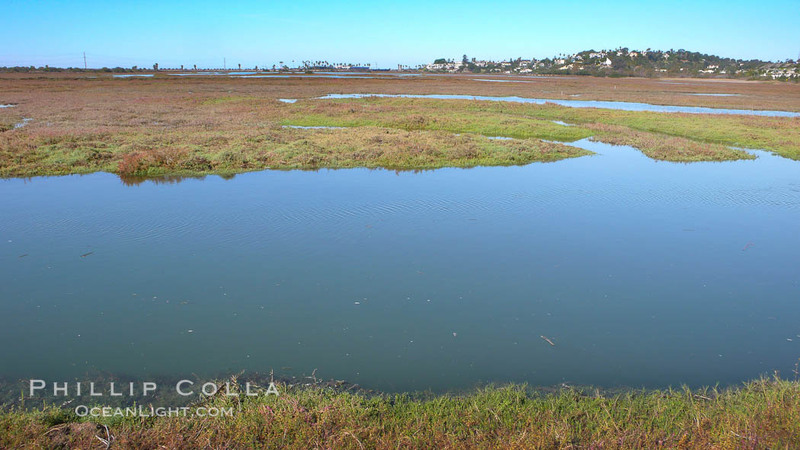 San Elijo lagoon at high tide, looking from the south shore north west.